Many references give table of atomic radii. Sometimes in text books and other sources, the rather vague term "atomic radius" is not defined and in such cases it is therefore not clear what the values actually mean. The values given here for atomic radius are calculated values using methods outlined in reference 1. These values are calculated using self-consistent-field functions (reference 1). You should consult reference 1 for full details, but it is not light reading for most people. There is a correlation between the atomic radii as determined from these calculations and the radii of maximum charge density in the outermost shell of the atom. 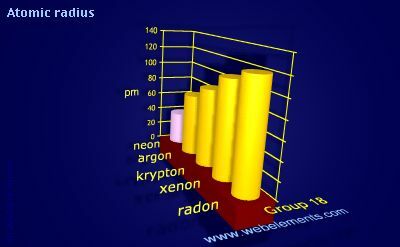 Image showing periodicity of atomic radii (Clementi) for group 18 chemical elements. E. Clementi, D.L.Raimondi, and W.P. Reinhardt, J. Chem. Phys. 1963, 38, 2686.